Despite the sloppy conditions this year, the girls race featured good battles up front with plenty of fast times. This year's Champion with an impressive time of 12:15 was 7th grader Rahyah Andressohn (pictured above) of Richmond Heights MS. Rahyah finished 5 seconds ahead of runner-up 7th grader Natalie Varela of West Miami MS. Rahyah and Natalie both run out of Miami and regularly compete against each other at the 2.1 mile distance run in Miami MS races at Larry and Penny Thompson Park. The venue moved up north but the close competition remained the same. Adding to the competitive mix was a strong race from Orlando area 7th grader Audrey McAnally of Trinity Prep who ran unattached in this race. Audrey finished less than 1 second behind Natalie while running 12:21. Meanwhile, Charis Ivey an 8th grader at Orlando's Southwest MS added to the up front battle by herself finishing less than 2 seconds behind Audrey while running 12:23. These marks are all ranked in the top 10 in the State for MS girls at the 2 mile/3200 distance. The boys race also featured a great battle up front courtesy again of Miami-Dade County. Belen 8th graders Rodrigo Madiedo and Henrique Souza battled to the very end with Rodrigo (11:36.24) reeling in Henrique (11:36.26) in the last few meters to get the win by 2one-hundredths of a second in a photo finish. 8th grader Wesley Cusack also ran a great race in the wet conditions posting a time of 11:39 to finish 3rd only 3 seconds behind the leaders. Wesley broke up a Belen wave that finished 1, 2, 4 and 5 in the race. The Disney girls MS race saw some fast times led by two out of state runners. 8th grader Cadi Rowe of Real Life Christian Academy was the top female finisher from Florida as she ran a speedy 12:06 to place third in the girls race. Cadi's time is the fastest in Florida this year at the 2mile/3200m distance. Charis Ivey (12:23), Ayjah Silemon (12:25) a 7th grader running unattached, and Bella Pawloski (12:29) a 6th grader running for the Hillsborough Harriers, each ran very well and posted times currently ranked in the top 10 for MS girls in the State. The Disney boys race was also won by an out of state boy. The battle for top Floridian proved to be an epic one as 7th grader Sol Weller of Indian Rocks MS and 8th grader Josue Reyes running unattached went shoulder to shoulder and stride for stride to the finish line. Ultimately, the camera had Sol (10:55.43) edging Josue (10:55.45) by 2 one hundredths of a second. As a result of this race, Sol and Josue sit atop the State rankings as 1 and 2 separated by the thinnest of margins. 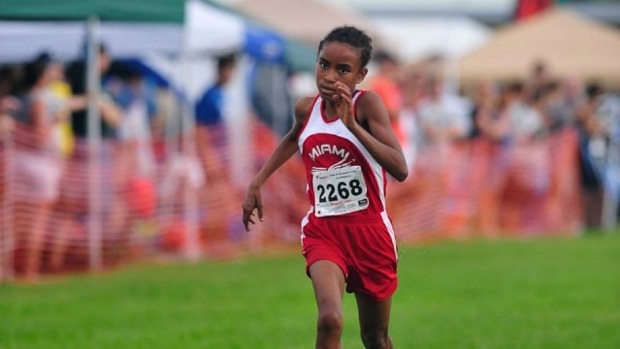 Not to be overlooked, Trinity Prep 7th grader Mamush Galloway finished less than one second back running a stellar 10:56. Finally, Andrew Shepherd an 8th grader running unattached posted a quick time of 11:12 which is now the 6th ranked time in the State. The girls race to determine the best in Miami-Dade County came down (not surprisingly) to another duel in the sun between 7th graders Rahyah Andressohn and Natalie Varela. Once again, Rahyah (12:32) proved to have a little more in the tank as she edged out Natalie (12:34) by two seconds. Another 7th grader, Ayjah Silemon, finished third with a quick time of 12:51. Ayjah shaved 18 seconds off her 2.1 mile time from a month earlier at the Youth Fair. The following girls also ran well posting top 10 times in the process: Jordan Shapiro (13:55), Lisa Adjouadi (14:05), Bianca Banato (14:11), and Melissa Martinez (14:29). The boys race for the Jr. Orange Bowl crown was even closer than the girls race. In yet another tight MS finish, 6th grader Adrian Bichara (12:13.66) of Ammons MS narrowly outran runner-up 8th grader Damauri Little (12:13.87) of Arvida MS to take first place. Adrian is the only 6th grade boy ranked in the top 10 at this distance. The following boys also ran well posting top 10 times: Michael Gutierrez (12:30.57), Yader Portocarrero (12:30.93), and Alex Carreras (12:40). Seventh grader Tori Orcutt of Liza Jackson Prep School took first place with a quick time of 11:48. Earlier this year Tori ran5:36 for 1600 on the track. Lindy Arthur, a 6th grader at Emerald Coast MS, was the runner-up with a fast time of 11:54. In 2013, Lindy finished 39th in this same race. In one year, Lindy cut over 2:30 from her XC 3k time. Eighth grader Erin Eubanks of Destin MS finished third running a good time of 12:02. Earlier this year, Erin ran 5:14 for 1500m and 5:42 for 1600m on the track. Eighth grader Kadrin Cabrera of Liza Jackson Prep School won the race with an excellent time of 10:47. This mark is 4 seconds faster than his 3k PR on the track. Gabriel Bohler of Lewis MS was the runner-up posting a fast time of10:50. Earlier this month Gabriel ran 12:26 for 2 miles. Eighth grader Patrick Hughes took third place with a quick time of 10:52. This was Patrick's first time dipping under the 11 minute mark for the 3k distance. Seventh grader Rahyah Andressohn won her third Super Qualifier race by running 11:44. Seventh grader Amanda Schwartz of Pinecrest (running under the Panther nation running club) took second with a time of 11:46. Sixth grader Mahdere Yared took third with a time of 11:50. Amanda and Mahdere have been competing all Fall for the Pine Crest HS varsity team and are regularly scoring runners on one of the best girls high school teams in the State. In the boys race, eighth grader Nicolas Rey of Palmer Trinity took first place with a quick time of 10:47. A few weeks ago at the Junior Orange Bowl Invite, Nicolas ran 19:56 for 5k at the Jr. Orange Bowl Invitational. Joe Closs, an eighth grader running unattached, took second with a speedy time of 10:57. Earlier this year Joe ran 5:41 for 1600m on the track. Javier Ventouse, a 6th grader running for Miami Elite took third place dipping under 11 minutes with a 10:59. Javier has shaved over 38 seconds off his 3k track PR from earlier this year. Seventh grader Ashley Klingenberg (11:33) got the win over another seventh grader, Audrey McAnally (11:43). Both girls' fast times rank in the top 10 marks in the State so far this season. On the boys side, eighth grader Aidan O' Gorman captured first place with a top 10 ranked time of 10:47. Eighth grader Nick Kamen got the win with a statewide top 10 time of 10:39. Eighth grader Lawton Campbell took first place with the State's second ranked time of 12:11. Seventh grader Alyson Churchill was runner-up with a top 10 statewide time of 12:23. Sixth grader Bella Pawloski got the win in a State leading time of 11:09. Fifth grader Ani Veltcheva took second place with a top 10 statewide time of 11:42. Sixth grader Bella Pawloski won the 2 mile race with a statewide top 10 time of 12:21. In the boys race, eighth grader Josue Reyes took first with a statewide top 10 time of 11:28. Eighth grader Katherine Resavage got the win with the third ranked time in the State of 11:27. Seventh grader Emily Molen also posted a top 10 statewide time by running 11:45. For the boys, eighth grader Clayburn Milford took first place with a blazing State leading time of 9:41. Seventh grader Johnny McClure (10:35), eighth grader James Ford (10:44) and sixth grader Kennan Milford (10:47) also ran top 10 statewide times. In the girls race, Bella Pawloski picked up another qualifier win running 11:18. This performance along with runner-up Charis Ivey (11:29) are top 10 marks in the State this year. In the boys race, Josue Reyes got the win running a top 10 time of 10:30. Congratulations to all the Middle School individuals and teams that have qualified for FLYRA's MS State XC Championships on November 1 at Lakeland's Holloway Park. Our FLYRA MS State Meet Preview article will run later this week.